One assured way to smartly save time while on business travel is to engage a reputed business travel agency. They will be able to chalk out and provide you with the finest details about your travel plan. They will be able to access the right airlines and find the right accommodation in places unfamiliar to you. Instead of booking your own business travel relying on the resources available through the Internet, you can save a lot of time if you entrust the job to a good travel agency. The standard of the hotel where you stay is important for the success of your business trip. For this reason, you need not waste time running around to identify the right hotel. An experienced travel agent will have the necessary contacts with many hoteliers, and can confidently fix the right accommodation within your budget. There are always more things worth doing and more valuable customers to meet on your business travel, so you have got to save the maximum time for purposeful activity than frittering it away in unproductive ways. 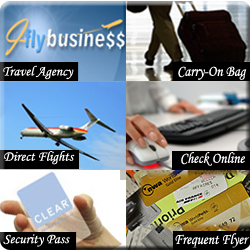 Here are certain other extremely useful tips to save time while on business travel. You may suddenly be required to go on a business travel with barely any time to prepare. It is best to get into the habit of keeping your carry-on bag with fresh clothing and essentials all the time. You may find this suggestion somewhat annoying, but this step will save you valuable time when having to embark on a business travel without much lead time. As far as possible, book direct flights and your travel agent will be able to achieve this for you. The agency will be armed with all the required information to suggest time-saving itineraries. Taking direct flights to and from your destination can mean huge savings in time. Sometimes, this may mean you can avoid overnight stays, which will also save on potential hotel, car and food expenses. Never forget you are living in the age of the Internet and therefore to save on time, you can check online. Check-in lines at many airports will entail long waits whereas checking online will enable you to bypass this tedious waiting and proceed directly to security. Of course, checking in online may not serve much purpose if you have luggage to check – therefore make it a point, as far as possible, to travel with carry-on bags only. Ask your travel agent to get you a seat near the front of the plane so that you can get off the plane quickly - and avoid waiting indefinitely in line with other travelers crowding in the aisles and elbowing their way to the exit. This will save you time as well as your sanity. Available at a number of airports is the facility for the ‘all clear’ security pass that is a high-tech card that permits pre-screened travelers to bypass long airport security lines. The card entails a nominal annual fees and appearing for a personal interview at the time of renewal - but the enormous time you will save will make it well worth spending this initial time and effort. Again, if you are a regular traveler flying too often, you should sign up for frequent flier programs as you can gain access to designated security and check-in lines, which are always shorter and faster leading to saving your valuable time.